Bunions tend to run in families, although it is the faulty foot mechanics that lead to bunions that are inherited, not the bunions themselves. Some authorities, in fact, suggest that the most significant factor in bunion formation is the poor foot mechanics passed down through families. However, the American Orthopaedic Foot and Ankle Society estimates that women have bunions nine times more often than men, that 88 percent of women in the United States wear shoes that are too small, and that 55 percent of women have bunions. Again, this reflects the wearing of shoes with tight, pointed toes, or with high heels that shift all of your body's weight onto your toes and also jam your toes into your shoes' toe boxes. It should be noted that it generally takes years of continued stress on the toes for bunions to develop. SymptomsMany people with bunions suffer from discomfort and pain from the constant irritation, rubbing, and friction of the enlargement against shoes. The skin over the toe becomes red and tender. Because this joint flexes with every step, the bigger the bunion gets, the more it hurts to walk. Over time, bursitis or arthritis may set in, the skin on the bottom of the foot may become thicker, and everyday walking may become difficult-all contributing to chronic bunion pain. 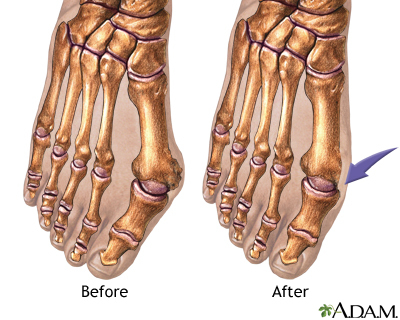 Bunion surgery is occasionally required when the bunion deformity is too advanced for conservative treatment to work. Your surgeon will usually cut an angular section from the bone to correct the alignment. In some cases, multiple toes may need to be straighten.